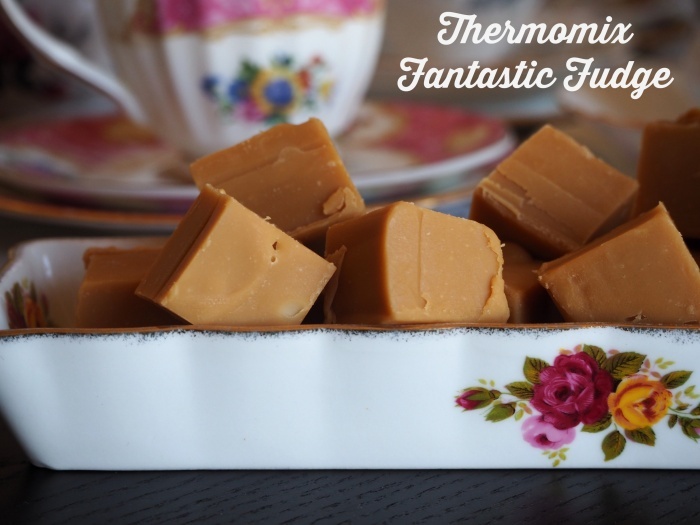 It was love at first sight when I saw Tash’s fudge recipe here. Having a set of seriously sweet teeth, I tried Caroline’s awesome original recipe, she was clever enough to convert the recipe to the Thermomix and did an excellent job! We loved it! So did everyone else, which is why my kitchen has turned into a fudge factory this Christmas. It’s not healthy but it is really delicious. It’s like shop bought, only better because it’s home made. Actually, it’s sublime, everyone says so! It keeps well in the fridge and you can freeze it too, although ours never lasts that long! Makes perfect prezzies in little candy boxes. Thank you Caroline for sharing the fudge love! Break up chocolate and place into TM bowl and chop for 5 seconds on speed 9 and set aside. Line a 20×20 tin with baking paper. I like Tash’s tip to brush the tin with water first, it helps the paper stay better. Carefully pour the mixture into the tin and leave to cool, and then refrigerate until set. Cut into small squares. This also works well with milk chocolate, but we love white chocolate the best. Do check out Tash’s tweaked version – there’s a great little podcast on the post with lots of helpful hints and tricks! Take care when pouring the mixture into the tin, it’s super hot! To freeze, wrap in baking paper and then plastic wrap. Fudge can be frozen for up to four weeks.